Despite popular opinion, the Grand Canyon of the Colorado River is not the deepest canyon in North America. Its notoriety comes from its accessibility and impressive length and width. The deepest canyon is actually Hells Canyon, formed by the Snake River and located on the Oregon-Idaho border in the northwestern United States (Figure 1). From bottom to top, this canyon is 2,700 m deep, compared to the 1,857 m of the Grand Canyon of the Colorado River. Despite its depth, the origin of Hells Canyon has been studied very little. Figure 1. Perspective view of Hells Canyon looking north. The canyon is cut between the Wallowa Mountains – to the west, and the Seven Devil Mountains – to the East. So what geologic event led to the creation of the deepest canyon in North America? There are remarkably few hypotheses regarding these foundational questions geologists typically asks: 1) Why is Hells Canyon there? 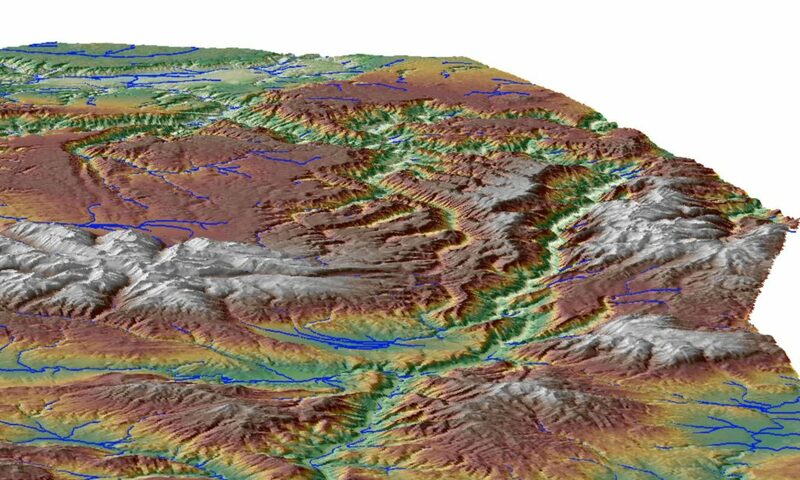 2) How did Hells Canyon form? 3) When did the canyon form? 4) What mechanisms led to the Snake River incise between two mountain ranges and cleave such an immense space in the surface of the Earth? As part of my PhD research, I set out to answer these questions by using several techniques now commonly used by earth scientists who attempt to understand the development of the Earth’s landscape. These techniques include thermochronology, which provides a measure for when rocks within the Earth cooled below a certain temperature, and cosmogenic nuclide dating, which allows a geoscientist to date when a rock surface was first exposed to cosmic rays from space, or when sediment was buried beyond the reach of these rays. In fast uplifting or fast eroding landscapes, thermochronology can accurately determine the rate of rock deformation. In canyons with large amounts of relief, measuring cosmogenic nuclides in river sediment buried in deep caves in the canyon walls, provides an indication of when the river was last at the level of that cave entrance. Both techniques can accurately measure river downcutting rates over the 1 to 10 million year timescale. 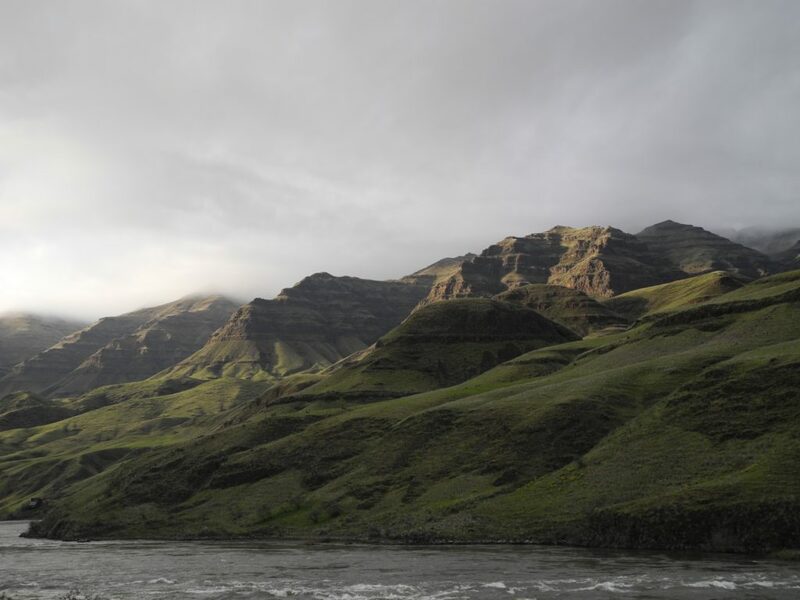 The surrounding geology suggests that Hells Canyon is less than 16 million years old. The Miocene age lava flows from the Columbia River Basalts erupted in the region, covering topography on both sides of the canyon. Just after the basaltic eruptions, and perhaps because of them, a large lake developed to the south of Hells Canyon. This lake, called Lake Idaho, persisted from 11 million to perhaps as few as 2 million years ago. The disappearance of Lake Idaho between 6 to 2 million years ago is one potential data point proving the age of Hells Canyon. With Lake Idaho draining and the funneling of a large upstream area previously flowing into the lake, it seems possible that this event is what drove the bulk of incision along the Snake River. To answer my questions, I collected thermochronology samples in a vertical transect from the deepest section of the canyon to the highest neighboring peaks (Figure 1). These data will provide a measure for when the mineral apatite cooled below 70° C. In a vertical transect, the samples at the highest elevations could record older cooling related to a pre-canyon time period, and the ages at the bottom of the canyon could record younger, accelerated cooling from canyon cutting. My data reveal an interesting trend, with the oldest ages (80 – 60 million years old) at the canyon rim. Ages at the bottom of the canyon are significantly younger at 8 million years ago. This implies that the canyon is younger than 8 million years. The cosmogenic dating technique should provide an even better indication of the canyon’s age. By looking at the age of sediment stranded within caves along the length of the canyon, we can 1) determine whether or not the sediment was related to a river that once passed through the canyon and 2) date the deposits using the radioactive isotopes 26Al and 10Be. We will be determining when these sands were last exposed to cosmogenic radiation, which is invisible radiation and falls down from the sky day and night. 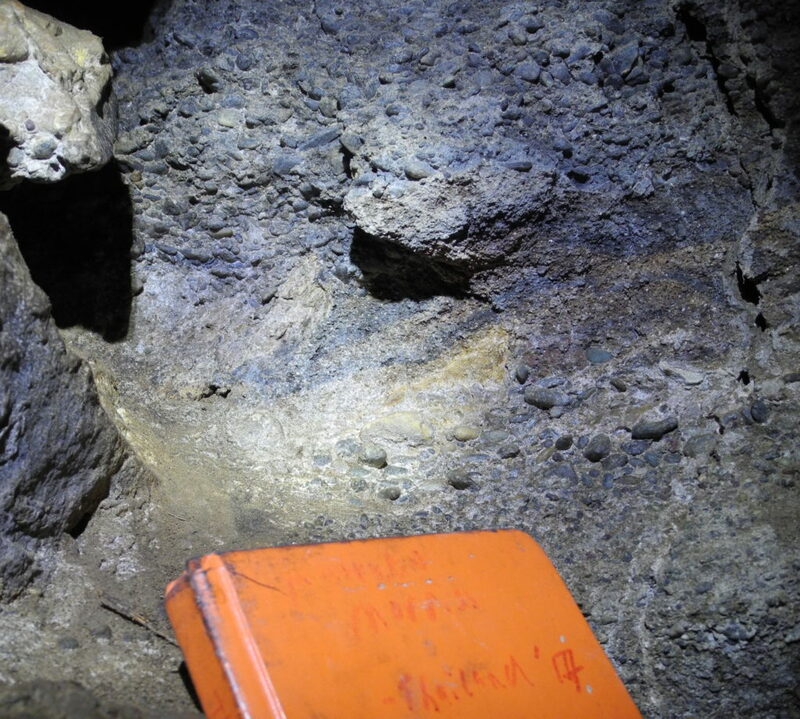 While results from this technique are not in yet, I have explored several caves along the length of Hells Canyon with the help of local cavers and located appropriate deposits and hope to have results by early Spring 2019 (Figure 3). Figure 3. Grains of quartz and basalt located 150 m deep in a cavern along the side of Hells Canyon. Understanding the processes at work in the largest landscapes on Earth are often key to understanding more about how our planet evolves through time. A constraint on how quickly Hells Canyon formed could unravel not only the mystery of this ultra-deep canyon but help us understand potentially catastrophically fast phenomenon: lake capture. Geologists often hypothesize gradual development as a key to understanding the past, but rapid and rare adjustments may also be just as, if not more, important than the long-lived slow processes to shaping our planet. Hells Canyon after a spring rainstorm. I have always been drawn to mountains, now I have an opportunity to study them. 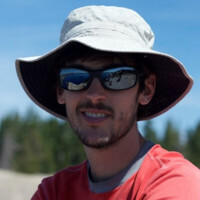 My name is Matthew Morriss, and I'm a PhD candidate at the University of Oregon, USA. I am studying the development of the deepest river gorge in North America: Hells Canyon. This project combines surface processes with deep, large scale mantle convection: a multidisciplinary project. 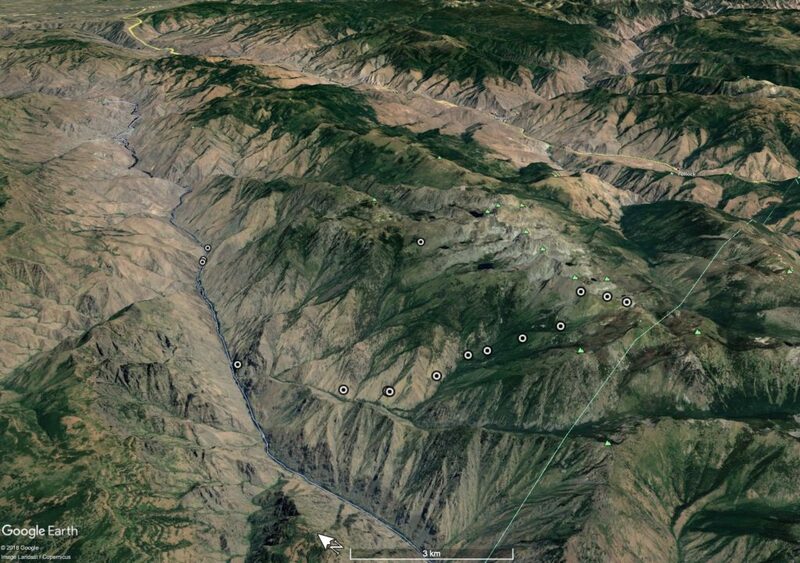 Tagged Deepest Canyon in North America, geomorphology, Hells Canyon, Snake River.